To think it is right to use force to override another person's preferences "for his own good" is the essence of the totalitarian personality. If you have the right to do that to someone else, then someone else has the right to do it to you. That way lies the rationalization for every conceivable kind of coercion. 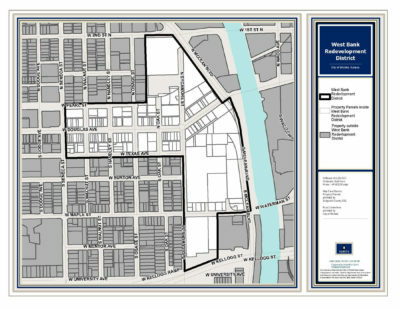 Wichita takes a big risk entering in a public-private partnership without knowing its partners. Click for more. Kansas hotel guest tax collections presented in an interactive visualization. Click for more. An interactive visualization of labor force, employment, and unemployment rate for all metropolitan areas in the United States. Updated with data through January 2019. Click for more. 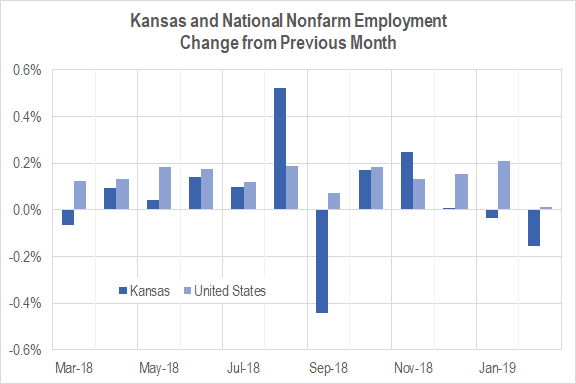 Employment in Kansas shows a seasonal decline for February 2019. Click for more. The City of Wichita plans subsidized development of a sports facility as an economic driver. Originally published in July 2017. Click for more. 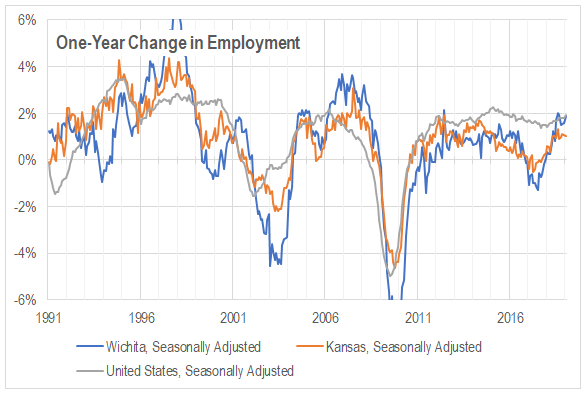 Overall, since 2001 — roughly the end of the Great Recession — Wichita has been gaining jobs, evidence being its trend line above zero in the nearby chart which shows the change in jobs over the same month one year ago. But the line has not always been above zero, indicating months where the Wichita metropolitan area had fewer jobs than the year before. Click for more. 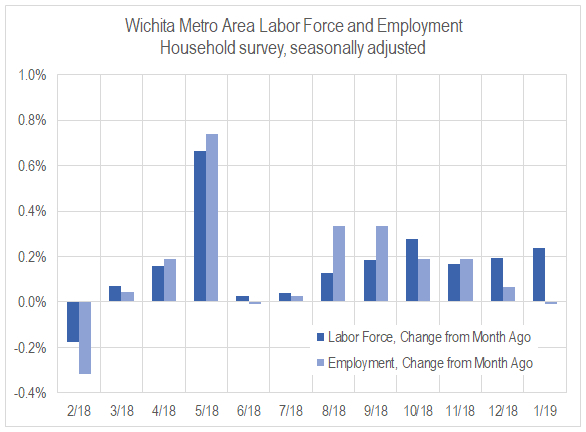 For the Wichita metropolitan area in January 2019, jobs are up, the labor force is up, and the unemployment rate is unchanged when compared to the same month one year ago. Seasonal data shows a slowdown in the rate of job growth and a rising unemployment rate. Click for more. The City of Wichita says it has safeguards built in to the proposed baseball park land development deal. We need safeguards. The city is borrowing to pay for the project, and the city expects to collect a lot of money from surrounding development, necessary to pay off the borrowed money. Click for more. 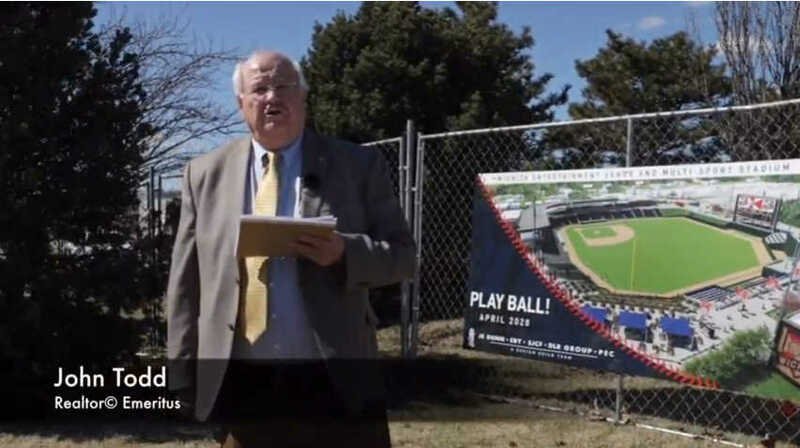 In this short video, John Todd tells us why the city is not acting in the best interest of citizens regarding the land development deal near the new Wichita ballpark. Click for more. The City of Wichita tells us it has thoroughly vetted the majority owner of the new Wichita baseball team. Click for more. Part of the agreement with the new Wichita baseball team is, apparently, unknown. Click for more. 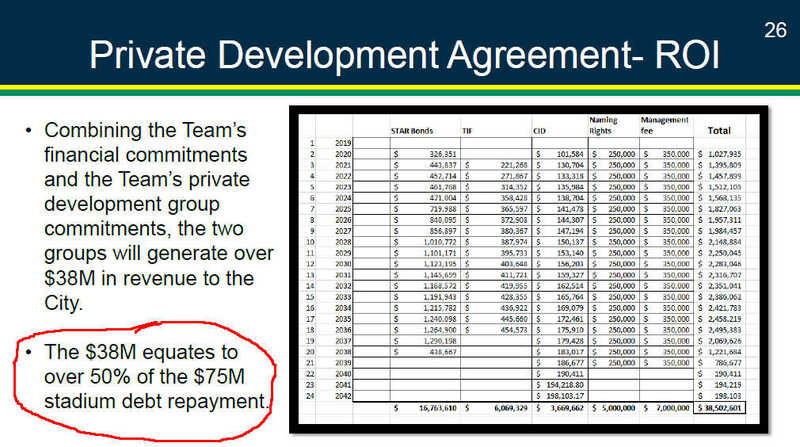 In a presentation, Wichita economic development officials ignore the cost of borrowing money. Click for more. The City of Wichita says it values open and transparent government. But the city’s record in providing information and records to citizens is poor, and there hasn’t been much improvement. Click for more. Kansas law requires publication of certain notices in newspapers, but cities like Wichita could also make them available in other ways that are easier to use. Click for more. 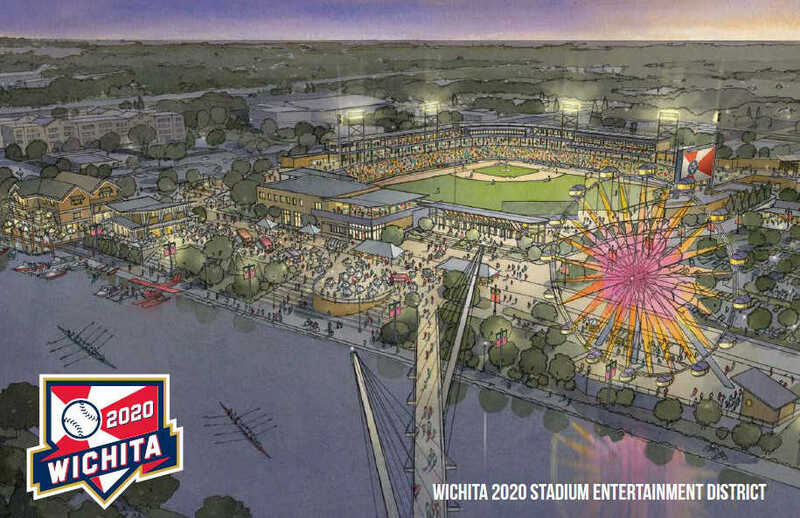 A bond disclosure document anticipated a development agreement for land surrounding the new Wichita ballpark. Click for more. 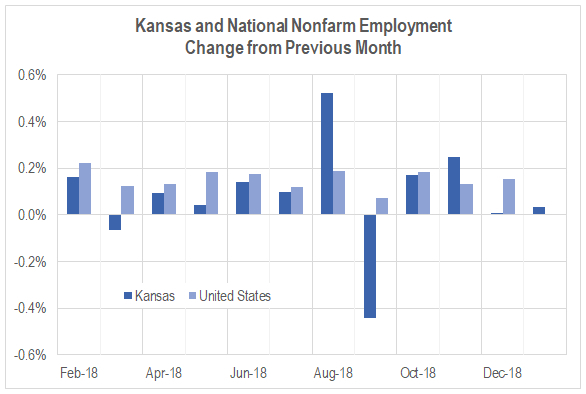 Data released today from the Bureau of Labor Statistics, part of the United States Department of Labor, shows a mostly improving jobs picture for Kansas in January 2019. Click for more. There was no successful Wichita city sales tax election. City documents were mistaken, which raises more issues. Click for more. The city of Wichita has included anti-poaching clauses in development agreements to protect non-subsidized landlords, but the agreements are without teeth. Click for more. 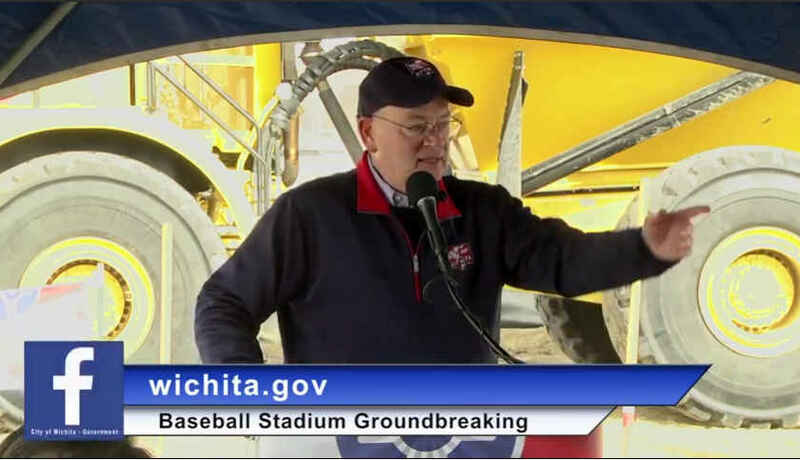 Press coverage of new Wichita baseball team majority owner Lou Schwechheimer. Click for more. 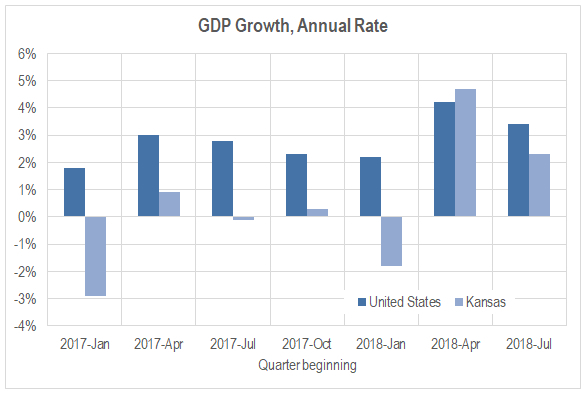 In the third quarter of 2018, the Kansas economy grew at the annual rate of 2.3 percent, down from 4.7 percent the previous quarter. Click for more. 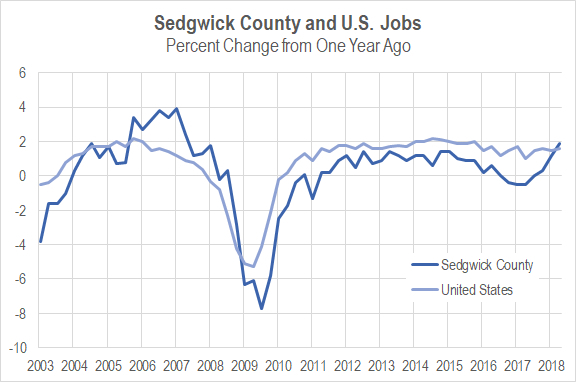 In the third quarter of 2018, Sedgwick County quarterly job growth exceeded the national rate for the first time in nearly ten years. Click for more. 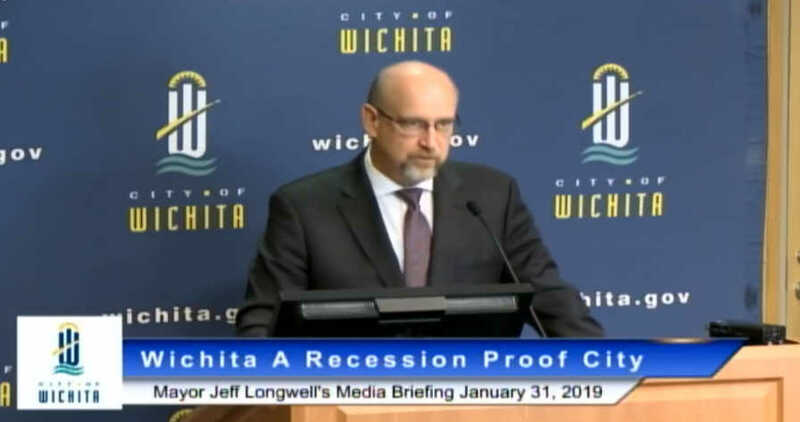 A gloomy jobs forecast is greeted with apparent approval by Wichita Mayor Jeff Longwell. Click for more. Sedgwick County needs to make sure past issues are known and settled before proceeding with hiring a new county manager, writes former commissioner Richard Ranzau. Click for more. The Wichita Eagle editorial board notices problems with a survey gathering feedback on Century II. Click for more. Wichita city leaders will latch onto any good news, no matter from how flimsy the source. But they ignore the news they don’t like, even though it may come from the U.S. Census Bureau, U.S. Bureau of Labor Statistics, or U.S. Bureau of Economic Analysis. Click for more. 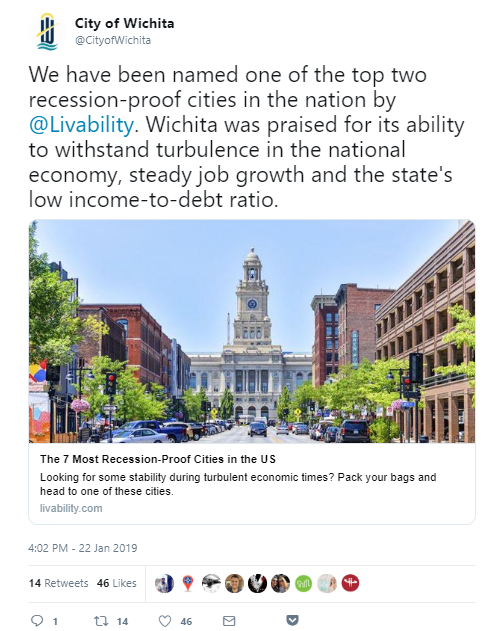 Wichita city officials promote an article that presents an unrealistic portrayal of the local economy. Click for more. A tweet from a top Wichita city official promotes great news that really isn’t so great. 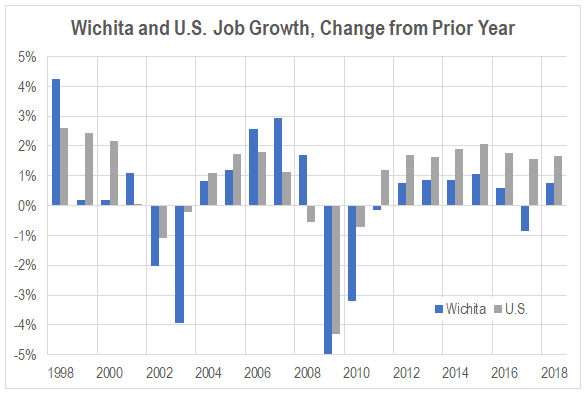 There is good news — Wichita is not forecast to lose jobs, as it has in the recent past. But the rate of growth seen for Wichita is not robust, and that’s a serious problem, especially when our officials think it’s good. Click for more. Data from the United States Census Bureau shows that the Wichita metropolitan area has lost many people to domestic migration, and the situation is not improving. Click for more.